What is rosacea? Is rosacea contagious? 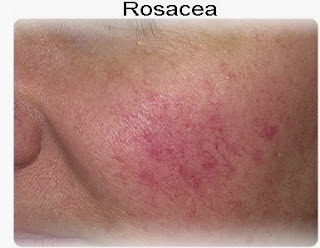 Rosacea (roz-ay-sha) is a very common red, acne-like benign skin condition that affects many people worldwide. As of 2010, rosacea is estimated to affect at least 16 million people in the United States alone and approximately 45 million worldwide. Most people with rosacea are Caucasian and have fair skin. The main symptoms of rosacea include red or pink patches, visible tiny broken blood vessels, small red bumps, sometimes containing pus, red cysts, and pink or irritated eyes. Most people with the disease may not even know they have rosacea or that it is a diagnosable and treatable condition. Many people who have rosacea may just assume they blush or flush easily or are just very sun sensitive. Rosacea is considered a chronic (long-term), noncurable skin condition with periodic ups and downs. As opposed to traditional or teenage acne, most adult patients do not "outgrow" rosacea. Rosacea characteristically involves the central region of the face, causing persistent redness or transient flushing over the areas of the face and nose that normally blush -- mainly the forehead, the chin, and the lower half of the nose. It is most commonly seen in people with light skin and particularly in those of English, Irish, and Scottish backgrounds. Some famous people with rosacea include the former U.S. President Bill Clinton and W.C. Fields. Rosacea is not directly related to alcohol intake. Swings in temperature from hot to cold or cold to hot can also cause a flare-up of rosacea. Rosacea risk factors include fair skin, English, Irish or Scottish heredity, easy blushing, and having other family members with rosacea. Additional risk factors include female gender, menopause, and being 30-50 years of age. What are rosacea symptoms and signs of Rosacea? Frequent flushing of the center of the face--which may include the forehead, nose, cheeks, and chin--occurs in the earliest stage of rosacea. The flushing often is accompanied by a burning sensation, particularly when creams or cosmetics are applied to the face. Sometimes the face is swollen slightly. A condition called vascular rosacea causes persistent flushing and redness. Blood vessels under the skin of the face may dilate (enlarge), showing through the skin as small red lines. This is called telangiectasia. The affected skin may be swollen slightly and feel warm. In rare cases, rosacea that is not treated may cause permanent effects, such as thickening of the skin on your face or loss of vision. It may cause knobby bumps on the nose, called rhinophymacamera. Over time, it can give the nose a swollen, waxy look. But most cases of rosacea don't progress this far. How Is the Eye Affected by Rosacea? Rosacea is usually diagnosed based on the typical red or blushed facial skin appearance and symptoms of easy facial blushing and flushing. Rosacea is largely under-diagnosed and most people with rosacea do not know they have the skin condition. Many people may not associate their intermittent flushing symptoms with a medical condition. The facial redness in rosacea may be transient and come and go very quickly. In unusual cases, a skin biopsy may be required to help confirm the diagnosis of rosacea. Occasionally, a noninvasive test called a skin scraping may be performed by the dermatologist in the office to help exclude a skin mite infestation by Demodex, which can look just like rosacea. A skin culture can help exclude other causes of facial skin bumps like staph infections or herpes infections. Blood tests are not generally required but may be used to help exclude less common causes of facial blushing and flushing including systemic lupus, other autoimmune conditions, and dermatomyositis. While most cases of rosacea are fairly straightforward, there are some atypical cases that are not as easy to diagnose. Although there is no cure for rosacea, it can be treated and controlled. A dermatologist (a medical doctor who specializes in diseases of the skin) usually treats rosacea. The goals of treatment are to control the condition and improve the appearance of the patient's skin. It may take several weeks or months of treatment before a person notices an improvement of the skin. Some people who have rosacea become depressed by the changes in the appearance of their skin. Information provided by the National Rosacea Society indicates that people who have rosacea often experience low self-esteem, feel embarrassed by their appearance, and claim their social and professional interactions with others are adversely affected. A doctor should be consulted if a person feels unusually sad or has other symptoms of depression, such as loss of appetite or trouble concentrating. Electrosurgery and laser surgery are treatment options if red lines caused by dilated blood vessels appear in the skin or if rhinophyma develops. For some patients, laser surgery may improve the skin's appearance with little scarring or damage. For patients with rhinophyma, surgical removal of the excess tissue to reduce the size of the nose usually will improve the patient's appearance. Can Rosacea Be Cured, Treated? Keeping a written record of when flareups occur may provide clues regarding what is irritating the skin. Using a mild moisturizer may be helpful, but avoid applying any irritating products to the face. Some people find that a green-tinted makeup effectively conceals skin redness. If your eyes are affected, faithfully follow your doctor's treatment plan and clean your eyelids as instructed. A dermatologist can prescribe treatments to reduce redness and any breakouts. One of the most important things is to learn what triggers your flare-ups, and then avoid them. It can help to keep a diarypdf(What is a PDF document?) of what you were eating, drinking, and doing on days that the rosacea appeared. Take the diary to your next doctor visit, and discuss what you can do to help control the disease. Stay out of the sun between 10 am and 4 pm. When you are outdoors, protect your face by wearing a wide-brimmed hat or visor. Use a sunscreen that is rated SPF 15 or higher every day. If your skin is dry, find a moisturizer with sunscreen. Use skin care products for sensitive skin, and avoid any products that scratch or irritate your skin. Try not to rub or scrub your skin. Gently wash your eyelids with a product made for the eyes. Apply a warm, wet cloth several times a day. Use artificial tears if your eyes feel dry. Or talk to your doctor about medicine you can put into your eyes. What happens to the nose and the eyes? Rosacea may or may not affect the eyes. Not everyone with rosacea has eye issues. A complication of advanced rosacea, known as ocular rosacea, affects the eyes. About half of all people with rosacea report feeling burning, dryness, and grittiness of the eyes (conjunctivitis). These individuals may also experience redness of the eyelids and light sensitivity. Often the eye symptoms may go completely unnoticed and not be a major concern for the individual. Many times, the physician or ophthalmologist may be the first one to notice the eye symptoms. Untreated, ocular rosacea may cause a serious complication that can damage the cornea, called rosacea keratitis. An ophthalmologist can assist in a proper eye evaluation and prescribe rosacea eyedrops. Oral antibiotics may be useful to treat skin and eye rosacea. Untreated eye rosacea may cause permanent damage, including impaired vision. Rosacea skin tends to be fairly sensitive and may easily flare with self-treatment or common acne therapies. Any home treatment or attempts for natural remedies should be approached with some caution. As with any rosacea therapy, some people may experience sensitivity or irritation with treatment. Several possible natural remedies, including dilute vinegar cleansing and green tea applications, may be useful in rosacea. Dilute white vinegar facial soaks or cleansing daily or weekly using approximately 1 part regular table vinegar to 6 parts water may be helpful. Vinegar is thought to help as a natural disinfectant and can help decrease the number of yeasts and bacteria on the skin. Since vinegar may flare rosacea in some people, a small test area should be tried before applying to the entire face. Smoking, spicy foods, hot drinks, and alcohol may cause flushing and should be avoided. Exposure to sunlight and to extreme hot and cold temperatures should be limited as much as possible. Red wine and chocolate are two well known rosacea triggers. Some listed foods may have no effect on your rosacea but severely affect someone else. Individual reaction patterns vary greatly in rosacea. Therefore, a food diary may help to elucidate your special triggers. Potent cortisone or steroid medications on the face should be avoided because they can promote widening of the tiny blood vessels of the face (telangiectasis). Some patients experience severe rosacea flares after prolonged use of topical steroids. 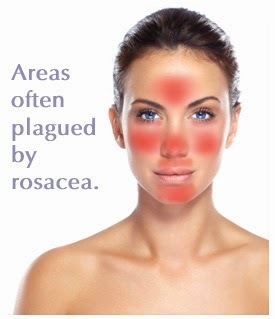 Vasodilator pills can also flare rosacea. Vasodilators include certain blood pressure medications like nitrates, calcium channel blockers, and thiazide diuretics. Some individuals have absolutely no symptoms and are not bothered at all by their rosacea. They may enjoy perfectly healthy normal lives without any effect from this benign skin condition. Some patients really like the pink glow to their cheeks and find it gives them a pleasant color without having to use blush. They may not even know they have rosacea. They usually do not want to use any treatment. Other patients have very bothersome rosacea that causes them issues on a daily basis. There are subsets of severe rosacea sufferers who have extreme psychological, social, and emotional symptoms. Some have developed social phobias, causing them to cancel or leave situations when their rosacea is flaring or active. Some patients complain of looking like they have been drinking alcohol when in fact they don't drink at all. Although rosacea is not a grave medical situation, severe cases may wreak havoc in some patient's lives. It is important for these patients to discuss their physical and emotional concerns with their physicians and to get professional help in treating their rosacea.